Skiing is all about posture and the mechanics of how you position your body. 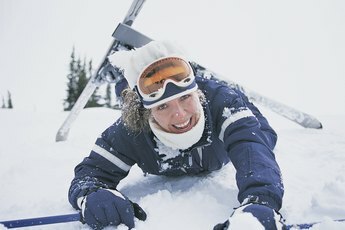 Skiing can be the most dangerous of all extreme sports or the least dangerous, depending on the slope you're descending and the conditions of the snow. Although the variables of skiing are limitless -- from almost vertically steep, ice-hard runs to gently rolling slopes with waist deep powder -- your body position doesn't change. The right posture for skiing determines everything, from your ability to control your speed and turn to stopping and wipeout prevention. If you can maintain the correct body alignment, the speed at which you ski and the grade of the runs you descend are almost boundless. Your head should remain fixed atop your shoulders like a soldier's and serve but one function, to look down the fall line. Your head should never lean forward or fall back or tilt to one side or the other. Your eyes should always be looking straight down the hill. Looking to one side of the ski run or the other serves no purpose because your line of descent is downhill. 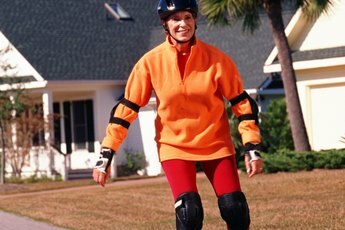 Like driving a car and watching the scenery out the side window, not looking downhill is one of the primary causes of wipeouts, crashes and burns, yard sales and starfish tumbles. Just like your head -- which sits like a statue atop your shoulders -- your shoulders should move very little when you ski. They have one position to assume and that is directly above your feet. Your knees and hips can move forward and back, respectively, but your shoulders remain in a straight line above your feet, and the parallel line between your shoulders and feet is perpendicular to your skis, which are horizontal to the slope of the run. Your shoulders can move up and down, and you compress and extend your body as you bend and straighten your knees. They can also move from right to left as you initiate turns. However, the right skiing posture for your body requires you to maintain a straight line between your shoulders and feet that is perpendicular to your skis. 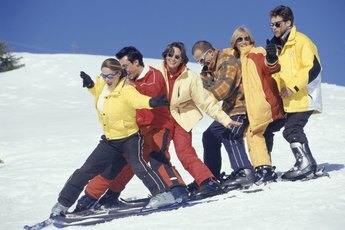 Skiing and driving -- surprisingly -- have a great deal in common in respect to body posture, particularly in respect to the positioning of your hands. Just like a steering wheel, the grips on ski poles naturally align your hands so your palms are facing one another. Correct skiing posture calls for hands in front of your torso, between chest and belly button high, and your elbows bent to the same degree as your knees. The bend in your elbows determines how close your hands are to your torso. The more you squat -- a means of lowering your center of gravity at high speeds -- the closer your hands are to your chest and to one another. The more you straighten your legs, the farther from your chest, and the farther apart, your hands should be. Your hands should be at least shoulder-width apart, but no more than 2 feet at all times. The correct ski stance is one that keeps the bottoms of both skis flat on the surface of the snow. In other words, keep your legs at least shoulder-width apart or closer, depending on your legs. If your legs are too far apart, you will be carving the inside edges of both skis, which will drive the tips of your skis into one another, or worse, across one another. Crossing your skis often leads to falling or wrecking. 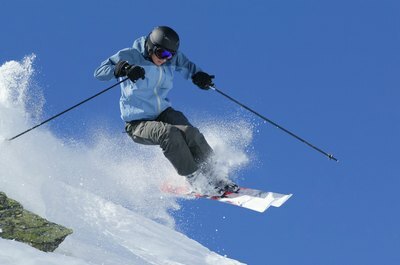 If your legs are too close, you'll end up riding the outside edge of each ski. The tips will shoot away from one another, and you'll end up doing the splits. What Are the Hardest Possible Rankings for a Ski Run?